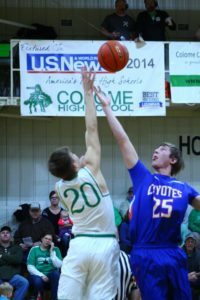 The Colome boys basketball team defeated Jones County 59-52 Jan. 16 in Colome. Jackson Kinzer scored 27 points and Layton Thieman added 18. Kolton Salonen pulled down 8 rebounds followed by Wyatt Cahoy and Calvin Ringing Shield with 6 each and 5 each from Thieman and Kinzer.